Developed in conjunction with the National Athletics Association of Zimbabwe, the Victoria Falls Marathon race is an AIMS (Association of International Marathon and Distance Races) registered event. The marathon race provides a platform for both local and international runners to pit themselves against the best! The marathon race route is fast and relatively flat and is well supported by regular water points and cooling down sections, all ably managed by the sponsors. A full 42.2km marathon race, 21.2km half marathon run and a 7.5km fun run is available. The marathon race route starts in the car park outside the banks/Ilala Lodge entrance, then crosses over the Vic Falls Bridge, briefly into Zambia offering the social runner some of the most spectacular scenery in Africa, the route continues through the Zambezi National Park with some great views of the river, and ends at the Victoria Falls primary school. The Full Marathon is a ‘double loop’. There are plenty of water points along the way to keep you refreshed, and you may even glimpse wildlife !Besides the breathtaking landscapes, you will encounter on the marathon race there is plenty more to do and see. Known as the adventure centre of Africa, for good reason, the Victoria Falls has a wealth of activities available! Choose one of the standard travel packages, or tailor-make your own by combining the marathon race with some rafting, canoeing, boat cruising, game viewing, an elephant back safari or even a bungee jump! Safaris in neighbouring Botswana and Zambia are also available through Wild Frontiers the official organiser of the Victoria Falls marathon race. Wild Frontiers would be happy to furnish you with details of travel packages in the surrounding region and make all your travel arrangements for you. In addition, there are daily flights from Johannesburg to the falls, which makes linking from international flights to the region easy. The minimum age requirement is that an athlete must be 20 years of age on the day of the race, for the 42km, and 18 years for the 21km. Fun Run participants have to be 10 years or older, unless accompanied by an adult. There will be water points on average every 4km. Some will serve water only, some will serve water and coke. Should you need any specific hydration or energy drinks, we suggest you carry that with you. The race is timed by a disposable timing chip, provided on your race number. It is imperative that you do not remove or tamper this chip, or your result may be jeopardised. Besides the breathtaking landscapes, you will encounter on the marathon race there is plenty more to do and see. Known as the adventure centre of Africa, for good reason, the Victoria Falls has a wealth of activities available! Choose one of the standard travel packages, or tailor-make your own by combining the marathon race with some rafting, canoeing, boat cruising, game viewing, an elephant back safari or even a bungee jump! Safaris in neighbouring Botswana and Zambia are also available through Wild Frontiers the official organiser of the Victoria Falls marathon race. Runners will run downhill and across the iconic Vic Falls bridge, to Zambia. Often, in the early morning, there is a chilly spray form the nearby Falls, and always great views – be careful of people stopping for photos! Turning on the Zambian side, just before the gate, we run back across the bridge, before turning to run along Zambezi Drive, along the Zambezi River, and the Big Tree. Look out for the game – elephants, buffalo and lion have been seen, as well as kudu, impala etc. There are National Parks rangers along the route to keep you safe. 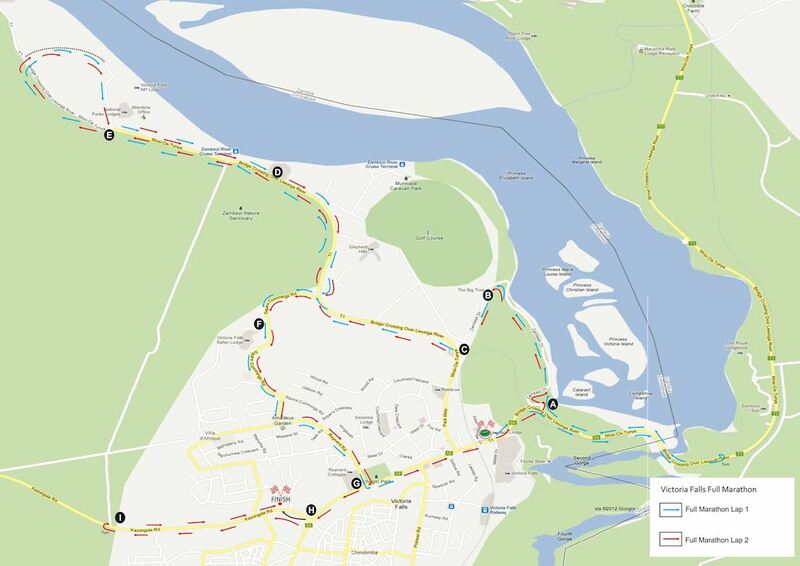 The route will be the same as the Full Marathon, but starts a little bit later at 07:15 am. When you get to the Sprayview Hotel waterpoint and marshals etc – do NOT do the loop again, but turn up to the right to finish at the school. Start: in the car park opposite the banks and Post Office – 08:15 and finishes at the school. This race does NOT cross the bridge. After Zambezi Drive and the Big Tree, the route runs back into town, through the suburbs and up the main road to finish at the school. The Victoria Falls Marathon is completely backed up, and manned by local organisations. Crowd control and traffic control are provided for, as is medical assistance and communications and sweep cars, marshals, signage, water and coke at some points.